What do you know or think you know about German and/or German? Write about foods, geography, location music, culture and other facts. After you have discussed. 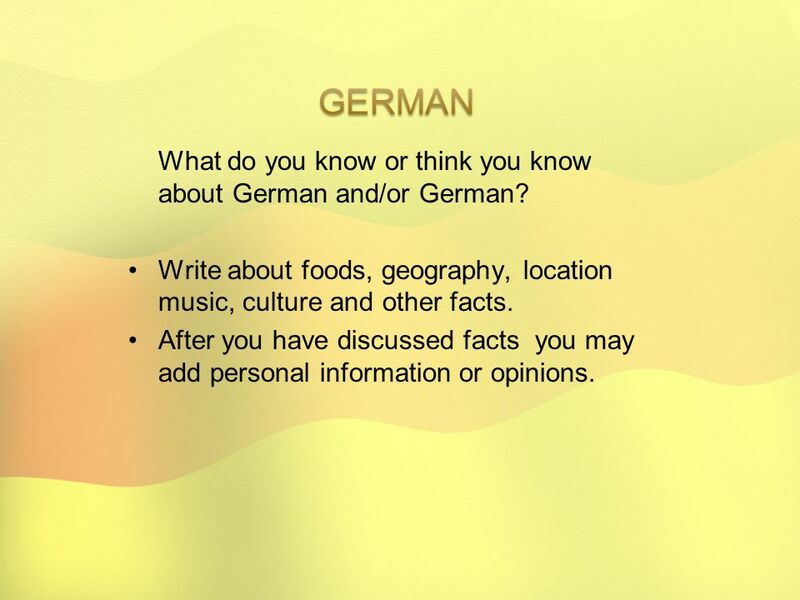 2 What do you know or think you know about German and/or German? Write about foods, geography, location music, culture and other facts. After you have discussed facts you may add personal information or opinions. 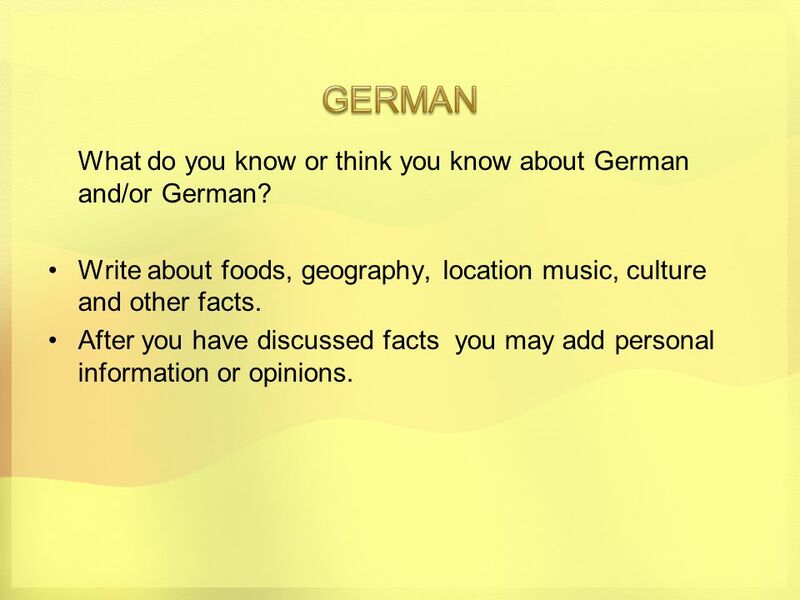 3 What do you know or think you know about German and/or German? Write about foods, geography, location music, culture and other facts. After you have discussed facts you may add personal information or opinions. 6 Tag, Eva. Wie geht’s? 7 Tag, Hans. Tag, Eva. Wie geht’s? 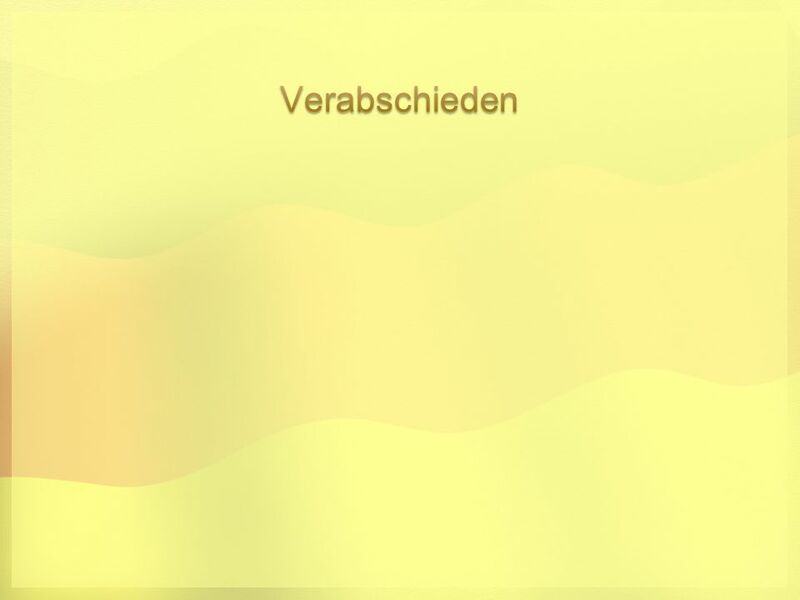 Gut, danke. Und dir? 8 Tag, Hans. 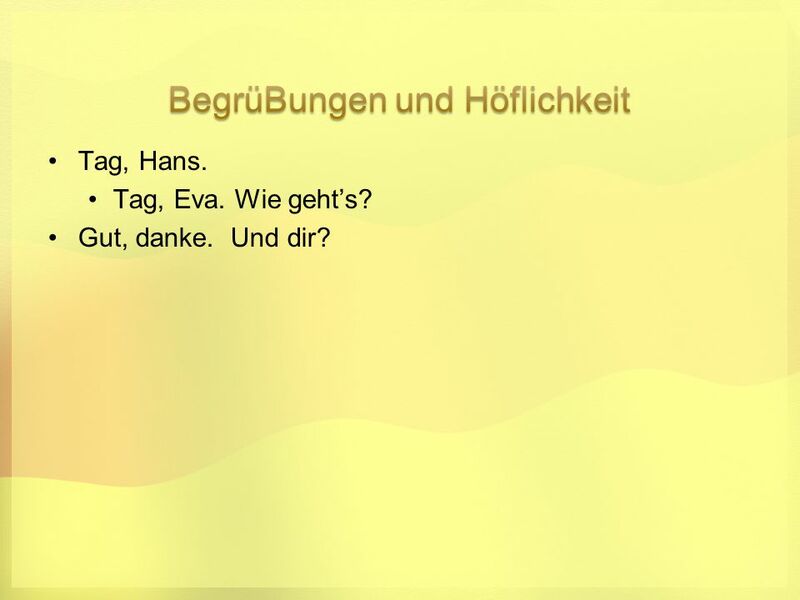 Tag, Eva. Wie geht’s? 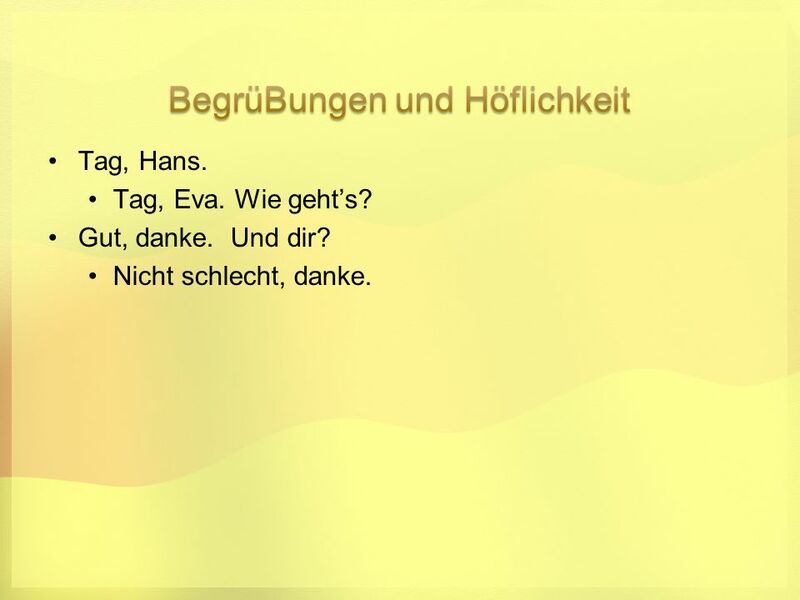 Gut, danke. Und dir? 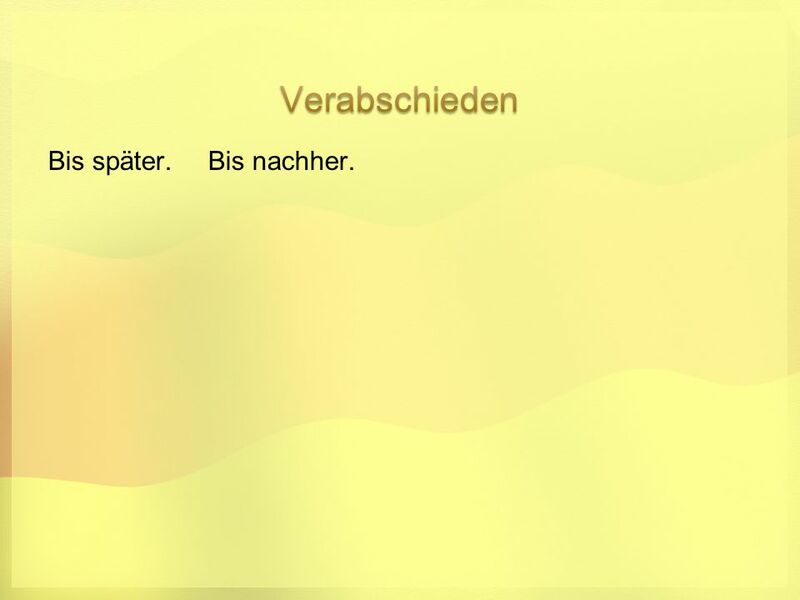 Nicht schlecht, danke. 9 Guten Tag, Herr Olin. 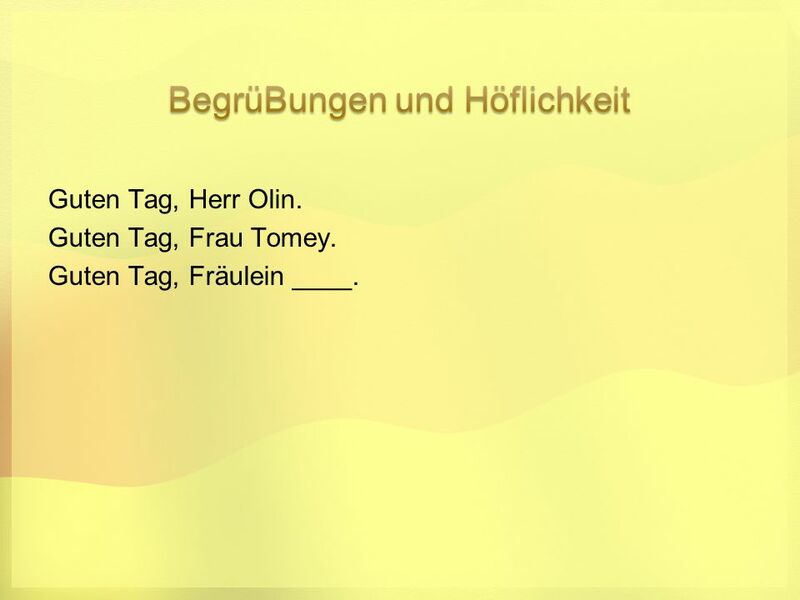 10 Guten Tag, Frau Tomey. 11 Guten Tag, Herr Olin. Guten Tag, Frau Tomey. Guten Tag, Fräulein ____. 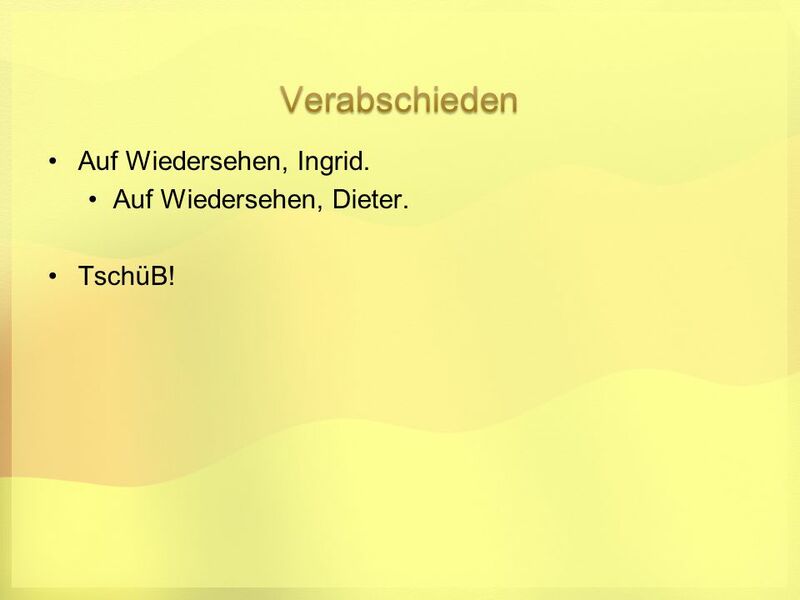 15 Auf Wiedersehen, Ingrid. Auf Wiedersehen, Dieter. TschüB! 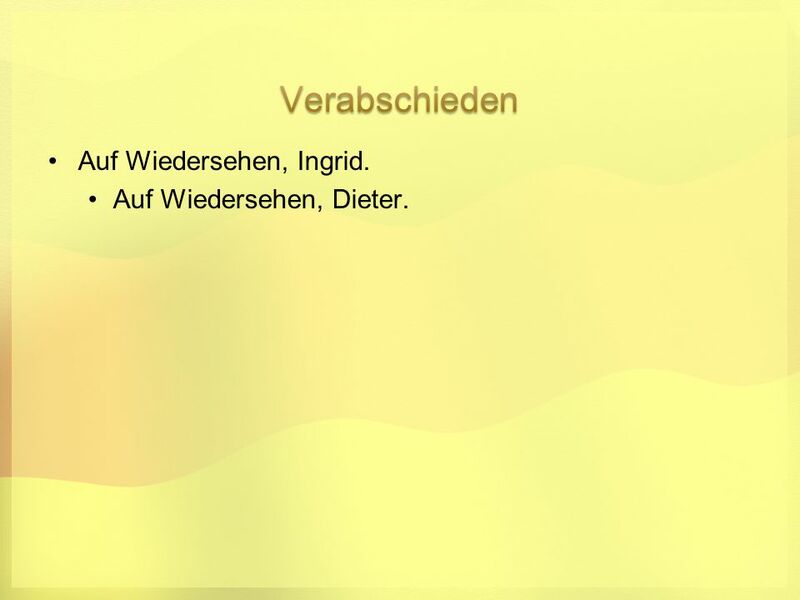 16 Auf Wiedersehen, Ingrid. Auf Wiedersehen, Dieter. TschüB! 17 Bis später. Bis nachher. 19 Bis später. Bis nachher. Bis morgan. TschüB. Tschau. 20 Tag, Hans. 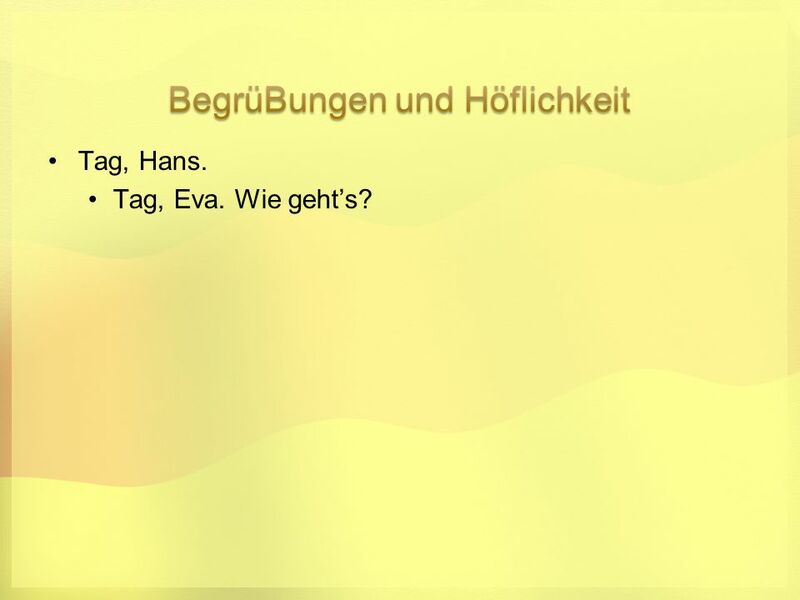 Tag, Eva. Wie geht’s? Gut, danke. Und dir? Nicht schlecht, danke. 21 Auf Wiedersehen, Ingrid. Auf Wiedersehen, Dieter. TschüB! Bis später. Bis nachher. Bis morgan. TschüB. 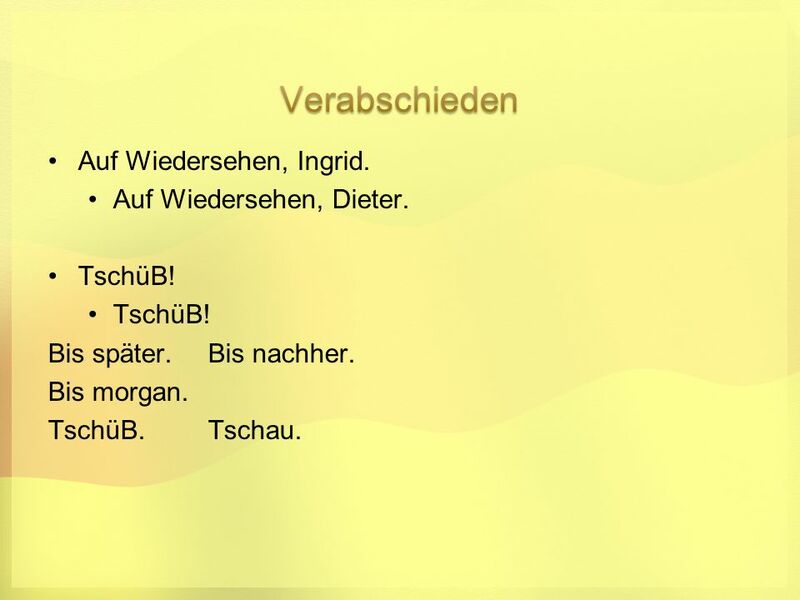 Tschau. 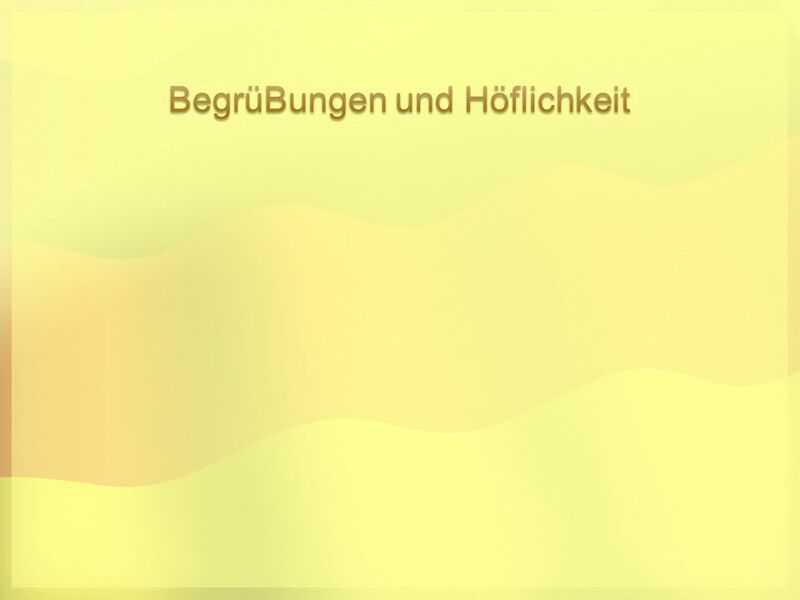 Herunterladen ppt "What do you know or think you know about German and/or German? Write about foods, geography, location music, culture and other facts. After you have discussed." Objectives: to use your opinion and adjective vocabulary to express opinions about a selection of German music to learn how to make basic comparisons to.